I don't know why more people don't grow soybeans. It looks like I have a real nice crop coming soon. 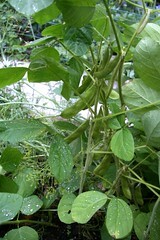 They were easy to grow and there are many soybeans on each plant. The season seems only a couple weeks longer than green beans. Maybe its not such a popular vegetable to eat, but I love edamame with salt as an appetizer. I'm curious to see if homegrown tastes better than the frozen soybeans I usually eat. 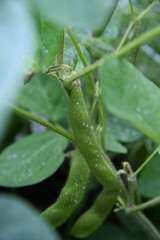 What variety of soybeans are you growing? Best Variety for Fresh Eating! Matures even in short season areas. Early to mature and with a densely concentrated pod set, these dwarf one-foot plants are heavy producers for the kitchen garden. Thanks, maybe I will try that variety out. I grew Envy soybeans for the first time this year, but it doesn't look like there are going to be that many pods per plant.